Where Can Cleantech Startups Find Funding in 2019? A roundup of VCs, accelerators, incubators and billionaires investing in cleantech. There's a new group of investors in town. 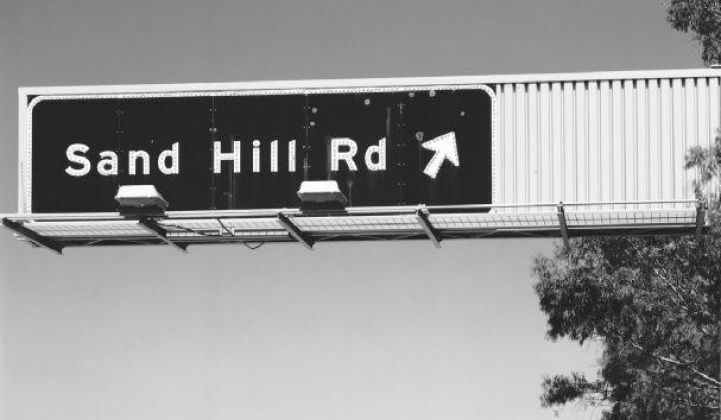 Once upon a time, 10 years ago, there were actually a number of funds and general partners at Sand Hill Road VC firms dedicated to early-stage alternative energy and clean technology investing. VCs directed almost $8 billion to cleantech in 2008 and 2011, building successes such as Tesla, Sunrun, Opower and Kurion, arguably successful firms such as SolarCity and Bloom Energy, and an extremely long list of unsuccessful companies. 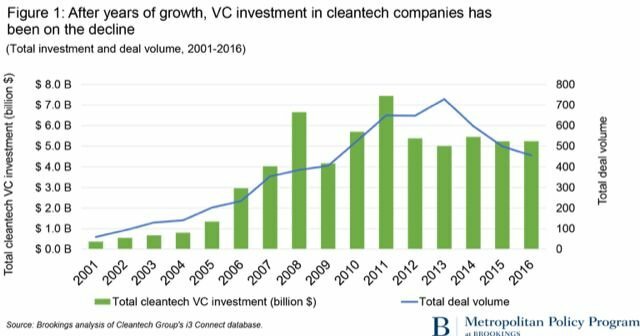 But VC investment in cleantech is down, even as overall VC funding has reached an almost dot-com-era fervor. According to a Brookings report, cleantech VC as a share of total VC investment fell from 17 percent in 2011 to 8 percent in 2016, with a trend toward geographic concentration and a drop in early-stage rounds. The days of enthusiastic early-stage funding for solar, wind or biofuels are long gone, but there is still an appetite for energy storage and batteries (such as QuantumScape and Stem), EV-charging infrastructure and smart grid (such as ChargePoint and Smart Wires), and home energy management (such as ecobee and Tado). A just-released report from Mercom Capital Group compiles a list of the year’s “top smart grid” VCs: Energy Impact Partners, E.ON, Ørsted and Shell Ventures. Excepting EIP, a financial fund backed by corporates, those are all corporate funds. EIP was also the most active energy efficiency investor in 2018, according to the report. The hard-won realization is that investing in alternative energy or utility-centric startups is not for most traditional VCs. Kilowatt-hours are a regulated commodity in a low-growth monopoly industry, and while we might be in an energy transition, the Smil-theorized speed of change in global energy sources is just too slow for venture capital. So, with limited VC to spark breakthroughs and scale firms in alternative energy and grid modernization, where can startups go for financing? What if a bunch of utilities pooled some cash and used it to fund mid-stage “inflection point” companies with proven grid technologies? That’s what 14 utilities including Southern Company, National Grid, Xcel Energy, Ameren, Avista and Tokyo’s Tepco are doing through Energy Impact Partners — which now has $531 million in equity and access to $150 million in debt. EIP has already invested more than $200 million into 20 startups including Advanced Microgrid Solutions, Arcadia Power, AutoGrid, BHI Energy, Cimcon Lighting, Clevest, Dragos, ecobee, Enchanted Rock, FirstFuel, Greenlots, Mosaic, Opus One Solutions, Powerphase, Ring, Sense, Sparkfund, and most recently, Urbint. Royal Dutch Shell’s venture arm just invested an undisclosed amount in AutoGrid, a maker of software that coordinates energy from solar arrays, wind farms and other distributed energy resources. Shell’s investment brings the Series D funding round to about $35 million, joining other corporate investors CLP Group, Innogy, National Grid, Ørsted, Tenaska, Energy Impact Partners, Envision Ventures and Total Energy Ventures. AutoGrid has more than 5,000 megawatts of DERs under contract with utilities around the world. American utility Duke Energy and Avista Development invested in Open Energy Solutions, a smart-grid startup providing consulting services and an “open-source” software platform for electrical grids. Italian utility Enel just launched a bond valued at over $1 billion to finance renewable energy, transmission and distribution networks and e-mobility projects. What about billionaires and foundations? Prime Impact Fund and Tribeca Early Stage Partners just co-led a $2.5 million financing round in Lilac Solutions, a lithium extraction technology startup. Prime enables foundations and philanthropists to invest directly in early-stage, high-risk technology startups. The CEO of Lilac, David Snydacker, argues that the EV market has driven the battery industry to such scale and throughput that much of the manufacturing cost has already been squeezed out, and we're starting to bump up against the cost of materials. Snydacker said that there are dozens of lithium resource developers that know where to find lithium-containing brine. "What they're missing is the extraction piece," he said. Prime, along with the Breakthrough Energy Coalition, also invested in Quidnet, a startup looking to convert dry oil and gas wells into subsurface pumped-hydro storage sites. The Breakthrough Energy Coalition comprises Bill Gates and 27 other billionaires with a pledge to fund emerging technologies and startups that are either too early, too risky or too slow for traditional VCs. Breakthrough just led a $26 million raise in Malta, a long-duration grid storage startup using a heat pump to store electricity and a heat engine to return the electricity to the grid. Last year, Breakthrough invested in Form Energy, a startup focused on very-long-term storage with aqueous sulfur flow batteries and an undisclosed chemistry. New Trump administration restrictions on Chinese nuclear deals forced startup TerraPower to abandon its pilot reactor project, according to reporting in The Wall Street Journal. TerraPower has been working on a traveling-wave reactor, a new design that could run on nuclear waste and extend uranium supplies for centuries. The startup was incubated at Nathan Myhrvold’s Intellectual Ventures and co-founded by Bill Gates about 10 years ago. “We had hoped to build a pilot project in China, but recent policy changes here in the U.S. have made that unlikely," he said. That leaves Gates and TerraPower in search of a new partner or relaxed regulations in the U.S. Confronted with a collapse in early-stage cleantech VC and uncertain support from the Department of Energy, more alternative energy startups are relying on corporate-funded incubators and accelerators. Shell’s cleantech accelerator (managed by the National Renewable Energy Laboratory) announced its inaugural class last month — with a focus on advanced grid technologies and long-term energy storage. Antora Energy is aiming to build an inexpensive thermal energy storage system. E-Zn is developing a zinc-based energy storage system. Electrical Grid Monitoring’s self-learning analytics yield better grid management and operation. Feasible uses sound waves and data analytics to perform battery diagnostics. Each startup receives a $250,000 grant, as well as access to finance, facilities and experts at NREL and Shell. The Wells Fargo Innovation Incubator, focused on the energy consumption of commercial buildings and other cleantech sectors, is deploying about $30 million, in chunks of $250,000 at a time, to startups vetted by NREL. Other cleantech and sustainability startup labs include: Greentown Labs, a cleantech startup incubator focused on hardware; Powerhouse, an incubator that invests in clean energy startups with a focus on digital technologies; Elemental Excelerator, which has funded more than 82 companies with $30 million in total investments; Enel’s innovation hub at UC Berkeley; and BMW's smart cities accelerator in Brooklyn. Last week, incubators Plug and Play and Y Combinator, along with Airbus Ventures, Initialized Capital and SV Angel, announced their investment in GBatteries, a newly unstealthed battery charging startup. If GBatteries’ technology can match its promises, it can help dispel some of the range and charging challenges confronting EVs. It’s not a new battery chemistry, but instead an adapter that can charge existing lithium-ion EV batteries much faster — without degrading battery lifetimes. Tim Sherstyuk, one of the founders of GBatteries, writes in a Y Combinator forum that the company has demonstrated “5 minutes to 50 percent charge, 10 mins. to 100 percent.” The business model is to license the technology to OEMs and to be integrated inside the vehicle, or as part of the charger. And as this roundup illustrates, cleantech entrepreneurs are taking that advice and finding capital and resources at incubators, accelerators, foundations and corporate investors — not with traditional VCs. This shift might not be limited to just the cleantech sectors. Three of the top four VC investors overall in the San Francisco Bay Area were startup accelerators in 2018, according to Silicon Valley Business Journal: Y Combinator, Plug and Play and 500 Startups. This came to pass in spite of the herd of unicorns in Silicon Valley and garishly sized sovereign wealth funds investing in scooters, taxis and shared work spaces. While the earlier era’s cleantech heavyweights (Tesla, Opower, Sunrun, SolarCity, Bloom, etc.) are solidly rooted in traditional venture capital, it’s possible that the next round of cleantech successes will get their funding from very different sources. But innovation is never done, and there’s always “the next big thing” to be funded by VCs. Congruent Ventures closed a $92 million fund last year to invest in early-stage sustainability and energy-transition startups, with founders Abe Yokell and Joshua Posamentier looking to show that the cleantech VC sector is still very much alive. The optimistic Yokell told GTM that his firm was seeing “tremendous deal flow” and that “building a company has become dramatically cheaper.” He said it was faster to get to revenue due to cheaper access to technology, outsourced labs, CFOs and legal services.